It didn’t take long for us to choose our gear and explain why. After you run through our reasoning, let us know what you would pick in the comments below or on Facebook. 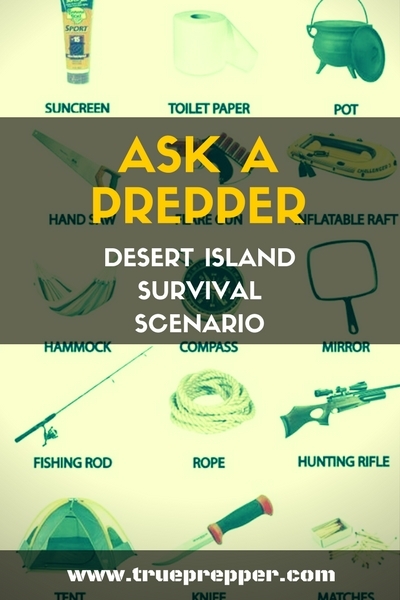 I am not too good at wilderness survival or bushcraft, but I would like to think that I am resourceful enough to survive with these resources. I think my choices reflect how I prefer multi purpose tools to give me more opportunities in bad situations. Hands down, a knife is one of the best survival tools you can have. The knife pictured looks like a basic Morakniv, which is probably what I would prefer in a survival situation. Whether I’m batoning branches for a quick shelter, feathering wood for a fire, or filleting a fish- a knife will come in handy. It looks like we get the gun here and six flares. I would bank on using four of the flares to start fires, and try to save the last two to signal nearby ships for help. I don’t have much experience starting fires using primitive skills, so having a tool that starts fires and signals for help is a great addition. A pretty hefty cast iron pot would be a pain to move around, but it can do so much for your survival. The main use would be to boil any freshwater I can find on the island. I would cook with it and use it as a container if I had to. Deserted islands are usually pretty small. Small islands don’t have a ton of resources. I would plan on using the raft to get out of dodge, if necessary. If I’m not going anywhere, I’m using the raft to collect water or as a shelter. My first priority for castaway survival is shelter. The TV show “Naked and Afraid” shows people on deserted islands getting burned badly by the sun. A shelter would keep you from getting wet, too hot, or too cold. With a saw, you could build the shelter you need. You also need the saw to cut down small trees for many other purposes. Some examples are a pallet to sleep on, benches, and shelves. You need the saw to cut wood for a fire. Also, to create a spear or arrows for hunting and self defense. Finally, when you get bored, bend it and whack it with a rock to use it as an interesting musical instrument. You won’t last long without fresh clean water, so a water filter would literally keep you alive. But with a fire, you could boil water and make it drinkable. You can also use fire to stay warm, cook something you catch, and burnish sticks to shape them. The only item on the list to make fire is matches, so you need to build a fire and keep it running all the time (even in the rain). To do that, you need to know how to create and store embers that you use to restart the fire. A quick Google will present you with many ways to do it. A rope will be your life-line (pun intended) for so many reasons. You can use it to tie a shelter together, build traps, and drag heavy logs. Also note that the rope is multi-stranded. Just like the many fibers on the inside of paracord, you can take some of the rope apart to make threads or fishing line. Then you don’t need the fishing rod which will get clogged with sand quickly and stop working. Make a hook out of a shell or barbed bush limb and you have a reasonable fishing rig. How can you boil water without a pot?! I almost forgot this important item! It can be used to gather water and cook food you catch. 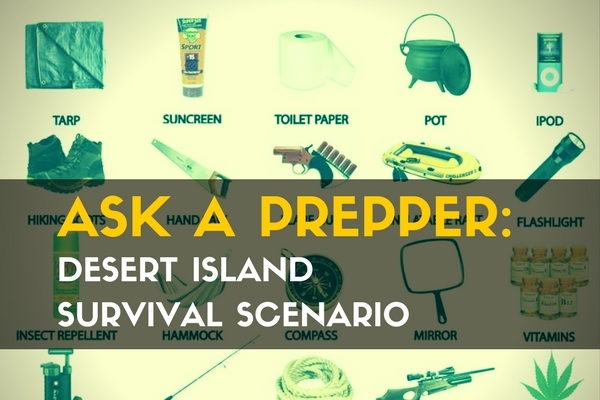 The pot and the matches are your water survival kit that will literally keep you alive longer. Also note that it has a handle and a lid. Both can be used as tools. The handle could be shaped into a barb or gig. The lid could be used as a frying surface. The point is to use every part! My four items won’t guarantee survival, but will give you a fighting chance to acquire the basic necessities of shelter, water, and food. After that, you’ll just wish you had that volleyball to play with! There are a few differences in our choices, but the same school of thought for the basic necessities. 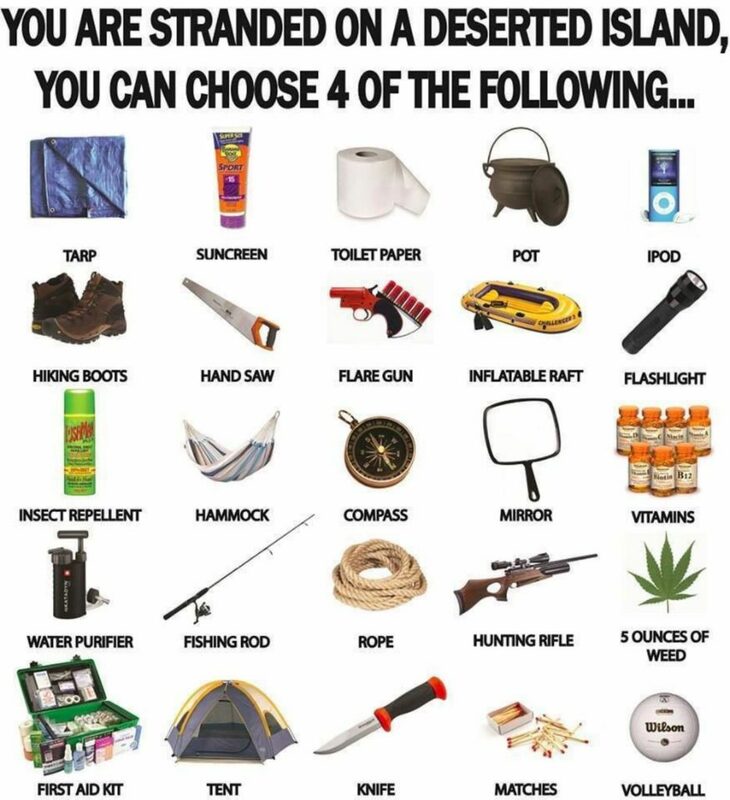 What four items would be your choice? Let us know in the comments below or join in the conversation on Facebook. Keep exploring, stay prepared, and be safe.